Angel Montes says the night Andres “Andy” Rojo lost his life began as a “joyful” one. 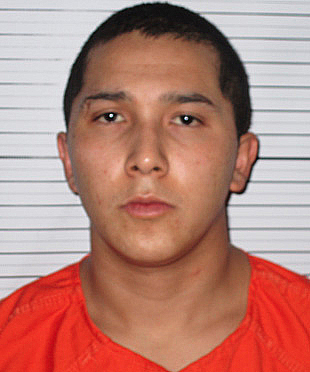 Montes, 27, the victim’s brother’s former brother-in-law, testified for the prosecution Wednesday in Fifth Judicial District Court in Carlsbad during the third day of the second-degree murder trial of Daniel Aguilera, 23, of Artesia. Aguilera stands accused of fatally shooting Rojo, 27, just after midnight on July 5, 2015, in the 1400 block of Yucca Avenue. He is also charged with aggravated battery with a deadly weapon for the non-fatal shooting of Rojo’s brother, Luis, 25, that same night. Montes told Judge Lisa B. Riley and the court Wednesday he was at the home of his sister, Heaven — then married to Luis Rojo — at 1407 Yucca Ave. for the Fourth of July 2015, along with several other family members and friends. He said at some point in the night, he, Andy and Luis Rojo, Heaven, and another individual walked a few houses down the block to the home of another friend. The man declined. The two left but came back later with the same instruction; again, he declined. Montes told the court he, Andy and Luis Rojo, and the owner of the second home remained in the yard as the two men returned with Aguilera in tow. He said the men remained in the street as Aguilera stepped onto the sidewalk and began again attempting to order the second homeowner to return. Montes said he approached Andy, who was lying on the sidewalk, and saw that he was soaked in blood, his hand on his chest. He could hear Luis screaming. He told the court his father and a neighbor, Roger Salazar, placed Luis in a vehicle and told Heaven to take him to the hospital. As Montes moved to return to Andy’s side, he said he saw Aguilera enter a vehicle and leave. Montes was asked if anyone had been “fussing or pushing” prior to the shooting, and he said no. He was also asked whether Andy Rojo had a gun at any point; he again answered no, saying no one in their group was armed. Also testifying for the prosecution Wednesday was the neighbor, Salazar, who said he was at home when he heard the sound of five gunshots outside. Salazar said he ran out of the house and spotted Luis, who told him he had been shot and to call 911 before collapsing in the street. Salazar helped place Luis in a vehicle for transport to the hospital. He told the court he then noticed a Hispanic male running down the road to the east. The man got into a Chevrolet S10 pickup, which drove away. The state next called to the stand Heaven’s father, Andrew Andrade, the owner of the Yucca residence and an instructor at the Federal Law Enforcement Training Center, who testified Luis owned a gun but had given it to him on the morning of July 4, 2015, in lieu of rent. Andrade said that gun along with his duty weapon were both in a lockbox in his vehicle at the time of the shooting. Andrade was indoors when he heard the gunshots. Seconds later, his son, Montes, came through the door and told him to get his gun, “they’re shooting at us.” Andrade said he removed his duty weapon from his vehicle and was looking for the source of the shots when he saw Luis. He helped place him in his daughter’s vehicle before making his way to Andy. Andrade said he applied pressure to Andy’s chest and remained with him until police arrived. He said he did not see weapons on the persons of any of the individuals in attendance at the party that night. The defense, which is claiming self defense in the shooting incident, questioned both Montes’ and Salazar’s testimonies, stating Salazar had previously told defense attorneys he had seen men at the neighboring home cursing at and shoving one another prior to the shooting. Salazar stated Wednesday he had gone outside prior to the shooting at the sound of raised voices and had witnessed the men “kind of shoving” one another but had also seen them appearing to hug, prompting him to assume all was well and move back into his home. Testimony in the trial is scheduled to resume at 9 a.m. Thursday. Aguilera faces a maximum of 18 years in prison should he be convicted of both charges.